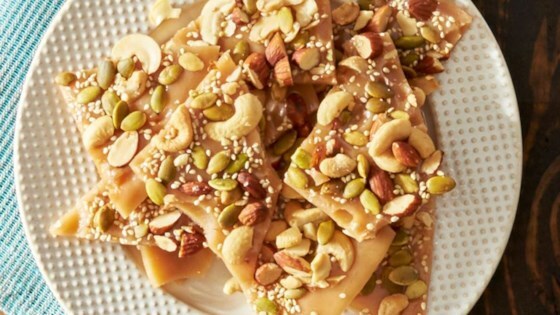 "This favorite candy gets a hearty update with almonds, cashews, pumpkin seeds and sesame seeds." Line a 15x10x1-inch baking pan with Reynolds Wrap(R) Non-Stick Foil; set aside. Melt the butter in a 2-quart heavy saucepan over medium heat. Stir in sugar, water and corn syrup. Bring to boiling over medium-high heat, stirring until sugar is dissolved. Avoid splashing side of saucepan. Clip a candy thermometer to side of pan. Cook over medium heat, stirring frequently, until thermometer registers 290 degrees F or a small amount of mixture dropped into very cold water separates into threads that are hard but not brittle. This will take about 18 minutes. Adjust heat as necessary to maintain a steady boil. Watch carefully the last 5 minutes to prevent overcooking. Remove from heat and remove the thermometer. Pour into the prepared baking pan. Tilt pan to spread mixture evenly. Let stand 2 minutes. In a small bowl combine the cashews, almonds, pumpkin seeds, and sesame seeds. Sprinkle evenly over candy mixture. Set baking pan on a wire rack. Cool completely and break into large pieces to serve. Making a tasty treat like this one doesn't have to drive you nuts when it's time for cleanup! By using non-stick foil, you won't have a sticky mess of a baking sheet to soak and scrub later. The brittle will break apart easily and turn out perfectly crispy and delicious. Forgot to shell the pumpkin seeds. Whoops. But otherwise, this turned out really yummy!